Nicholsons Chartered Accountants has pledged its support to local club Market Rasen Cricket and Football Club. The firm, which has offices in Rasen and Lincoln, is sponsoring the club’s development team and presented them with new kit at Rase Park last week. Company director Richard Grayson once played for the club. “We hope to see talents being developed in Market Rasen, and it’s also a way for us to give back to the community,” he said. * Market Rasen Town endured an afternoon to forget on Saturday as they shipped seven goals at Immingham Town in the Lincolnshire League. Rafael Garda Figueras Negrillo and Nathan Smith found the net for Rasen, but they were the scantest of consolations as the league’s third-highest scorers ran riot at Woodlands Sports Ground. Player-manager Gary Nimmo and Brandon Smyth both hit doubles, while Liam Van der Weele, Wayne Long and Thomas Hobson were also on target for the Pilgrims. 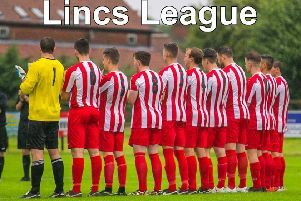 It was Rasen’s seventh straight defeat since they defeated league leaders Grimsby Borough Reserves and the scoreline continued their poor away form with 16 goals conceded on their last three trips away from Rase Park. Town sit ninth in the table, but take a break from their league woes on Saturday when they host top four opponents Hykeham Town in the first round of the Supplementary Cup (kick-off 1.30pm). Ominously, a quarter-final trip to Immingham awaits the winners of the tie.